Today I was talking to a respected rabbi I am friendly with, who is currently researching the concept of the GR"A megillah. 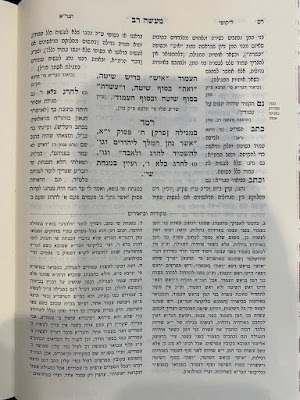 He sent me a photo of a page from the Ma’aseh Rav of the Gra, Weinreb edition, and noted that the Likutim on the side begin the discussion quoting the Tosefes Ma’aseh Rav written by R’ Eliezer Landau, great grandson of the Gra, re the need for Amudim ( Atzei Chayim equivalent) on the Megillah. B) Insisting on at least 1 Amud which would achieve both; Having an Amud and at the same time differentiating the Megillah as an igeres from a Sefer Torah and other Sifrei Nevi’im. Is it then fair to state that people buying a megillah who wish to keep the shitta of the Gra should be ensuring it has an amud (wooden handle) on at least one side? Another point to make is that is that the 11 line Megillah known today in the market as the Gra megillah is actually not the type of Megillah used by the Gra. The Gra either wrote or commissioned a ‘normal’ Megillah to be written for him, where the Aseres Bnei Haman etc was written as an extension of the regular size Ktav of the Megillah, not in big letters but uniform in size with the rest of the Ktav in the Megillah and as a continuation of a regular column of ktav in the Megillah, not it’s own Amud of writing. My understanding is that in order to satisfy both the opinion of the Gra not to write the 10 sons of Homon in larger letters, and the opinion that they should be written completely in their own column..... the 11 line Megillah was invented as the perfect solution and seems to now be called a Gra Megillah. 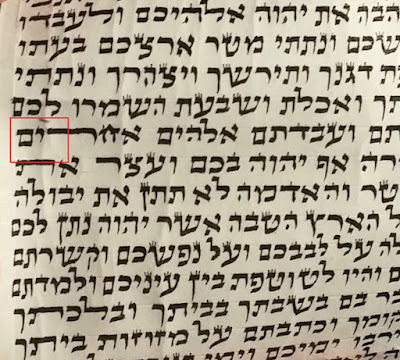 It seems that the style of the Gra's personal megillah, namely the aseres benai homon written in normal size and not in its own column, is not really done today (except, paradoxically, by Chabad). The Gemara seems to say that even ספרי נביאים have only 1 עמוד, which is the source for a bit of discussion as to why most have 2 nowadays, and why the Gra seems to say 2 as well. In any event, I have never seen a Megillah with 2 atzei chayim. Most Megillos written according to the Gra have only 1, at the end. It is correct that the Gra himself did not have an 11-line Megillah. The difference between his shitah and that of Chabad is that Chabad writes the 10 Bnei Haman at the top of a column whereas the Gra held it should be at the bottom. Others hold they can be anywhere within a column. The actual Gra megillah,42 lines with the aseres at the bottom of column has not been used for around 200 years. The 11 line megillah is how we now fulfill the opinion of the Gra that the aseres be the same size as the rest of the megillah. Those that are following the Gra should/will put a pole on the end of the megillah, as the Sephardim do. 1. On what basis is, the Gras's Hakpodo, to have 42 lines in the Megillah, - just as in a Sefer Torah, ignord. and still called "following the Gra"? 2. On what basis, "Those that are following the Gra should/will put a pole on the end of the megillah"? A. If they are "following the Gra" shouldn't they have two? B. Why "a pole on the end of the megillah" and not on the beginning? First chasidus: the Pnei Menachem used an 11 line megila and wrote in a letter to Reb Menashe Klien that so is his minhag.when he was rebbe he used an 11 line megilswith 2 amudim. 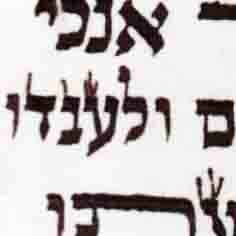 The bnei yisaschar wrote a megila the picture shows it has an amud. 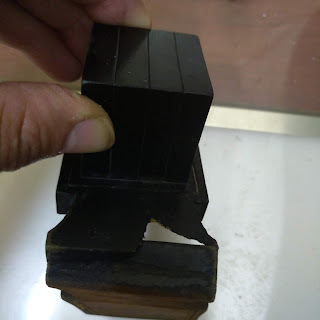 I did hear that the amud is from a case and while in case it had a front little wood as well. Often we try to satisfy as many shitos as possible however to go against rema is not so simple. Just wondering: I have read Maase Rav and similar seforim of the Gaon's hanhagos and I have never seen any mention of him being makpid on 42 lines, merely that the Aseres Bnei Haman should be written in their normal size at the bottom of the amud. What is your source for 42 from the Gaon? According to the mechaber of Toras Hagilyonos the pashtus is that the megillas Hagra was 42 lines but no one can say for sure. are all connected. it's the same Machlokes, whether Megillas Ester has the same Din as Sefer Torah.